It’s that time of year again. The bugs are back. And it always seems as though they’re far too interested in dropping by to say hello. And having someone come out and spray your house for bugs quarterly gets really expensive. Did you know that you can do it yourself for far less money? I’ve been doing my own pest control for over a year now. Here’s my follow up post to dish the details. Hint: It’s saving me lots of money. The pesticide I’m using is called Talstar One. The reviews are wonderful and it is widely used by pest control companies. That means that you if you buy this stuff you are stepping up into professional grade territory. Quit messing around with the baby bug killers found at your local home improvement store. It’s pet safe when dry. Just don’t have your dog outside with you when spraying. But other than that your furry best friend will be fine after letting it dry for about a half hour. It doesn’t irritate your skin. If you get some on you it won’t burn. Just take a shower afterwards! So is it worth it to go the DIY route for saving money on pest control? Yes! Here’s why. Going the DIY Pest Control route is EASY! You might have read the headline and just assumed that killing your own pests just isn’t worth the hassle. Well I assure you, it is. I totally understand that some things just aren’t worth your time – like changing your own oil perhaps. But pest eradication is worth another look. 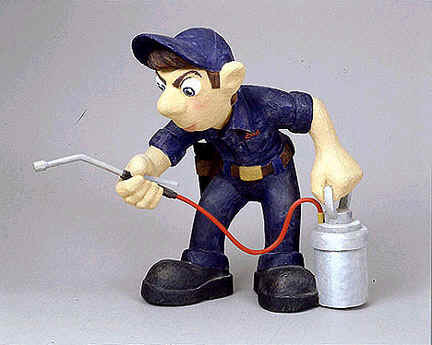 Total time commitment for DIY pest control: A maximum of 1 hour every 3 months. The solution is incredibly easy to mix and getting out in the yard with the sprayer is actually kind of fun. Going the DIY Pest Control route saves BIG Money! As I documented in my first post, I spent roughly $55 total to outfit myself for a decade of bug prevention. I got the ¾ of a gallon bottle because it’s the best value. Toss that and a sprayer in your cart and you’ll be spending less money in one transaction than on one visit from your current pest control company. That means that the savings start immediately. Bonus: Talstar One can actually be used to prevent termites as well! While you could certainly outfit yourself with a DIY Sentricon system too, Talstar One battles those wood eating maniacs as well. I don’t even have a termite bond. I just use Talstar. Their claim is that “it provides a barrier that termites can’t even penetrate.” I like the sound of that. Bonus number 2: It also combats mosquitoes. I’ve seen a lot of companies around my neighborhood lately that claim to eradicate those blood-sucking pests. I’m sure they do a great job but it certainly doesn’t come cheap. Instead, spray the leaves closest to the ground on the trees in your backyard. Doing that a few times throughout the spring and summer should help keep those punks away and make your outdoor space actually enjoyable. The website Do My Own Pest Control has incredibly competitive prices and a great coupon code right now for $5 off a $50 purchase – just type in “givemea5” at checkout. And their products aren’t available in your local Lowes, Home Depot, Ace Hardware, etc. They also have a very helpful instruction video when you scroll down the page in case you’ve never done any spraying for pests before. How much we choose to do ourselves almost always comes down to the combo factor of time and money, right? If it can save us enough money without taking up too much time, it’s probably worth it. DIY pest control has been the perfect intersection of taking very little time to save a lot of money. I used to spend almost $300 a year on a pest control service to come to my home. I now spend roughly $5-$10 to do it myself. And as I’ve mentioned, the time commitment is extremely low. Just to reiterate, there are basically two websites (that I know of) that sell these professional grade products online. I used Do My Own Pest Control and their customer service has been fantastic! But don’t forget the Do My Own Pest Control coupon code (givemea5). Oh, and did I mention that shipping is always free!? I hope this helps. I’ve really enjoyed saving money on pest control services thanks to Talstar and the availability of superior bug eradicating products online. 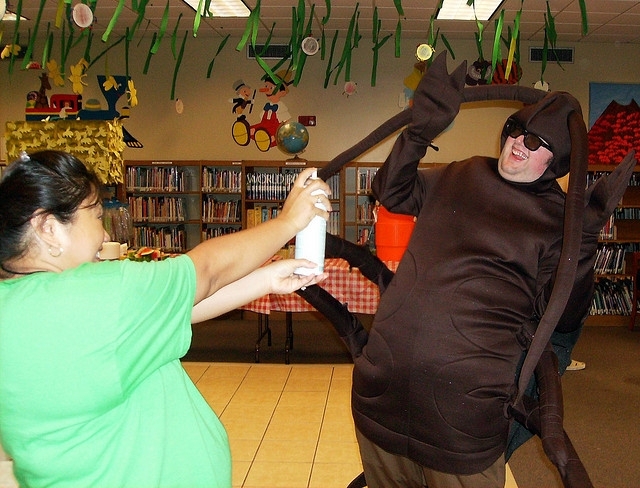 Do you spray for pests yourself? If not, what’s keeping you from attempting DIY pest control? I did this a few weeks ago and am pretty happy with the results. I haven’t seen any bugs in my house for a while. I didn’t know about the mosquito trick though, so I will be trying that tonight. That is pretty exciting stuff. Here is what I wonder though. How far do mosquitos fly from their homes? If I spray my trees but none of my neighbors do am I really doing any good? Good question Andy. I don’t know much about the migratory habits of mosquitos but It should still provide some relief. I spray the gutters around my back porch and it has made a noticeable difference. I get a lot of bees for some reason but I’ve seen a lot less and even seen a few dead ones. Hi Joel, I like your blog – lots of good info! I just wanted to mention that bees are good as they pollinate the flowers, fruits, and vegetables and unfortunately there seems to be a huge decline in bee hives per the news. You are right. I promise I’m not killing bees on purpose. Just trying to get rid of the other yard pests that want to come in my door. Thanks for yourcomment! You are right. I promise I’m not killing bees on purpose. Just trying to get rid of the other yard pests that want to come in my door. Thanks for your comment! I read your article last year about this and took the plunge after watching the video on their site. I’m nowhere close to a do it yourself kind of guy, but even I thought this looked simple. So I went out and bought the same product. They even price matched when I emailed them a lower price from a competitor. And, I’ve been bug free for a year now. Except for spiders. Those pesky things need some other treatment. So I went to the same site and found some stuff for them too. And then I got moles in the backyard. Sure enough that same site had a cheap fix for that. All this for less than $100. Thanks so much for the tip! No way dude! That’s so great! One of the things I love about DIY pest control is that you really don’t have to have any actual DIY skills. I’m probably the same skill level as you. And similar to your mole problem, I had a rat recently. I got a great outdoor rat bait system from them too. They have the best customer service AND the best products. I’m really glad it’s worked out well for you man! When you want to save you gotta learn to do things yourself. This is why I always applaud guys like you who are willing to get on their hands and knees to find ways to do something instead of just paying for it. An amazing product that is pet and human safe and more effective than even the professionals on just about everything will cost you somewhere around $8 at Home Depot for an almost lifetime supply. It’s an odorless, pleasant powder that doesn’t stain and is so easy to use and rapidly effective… it’s phenomenal. After trying everything including the professionals, this was the only thing that rid my house of fleas and it worked in a few hours without needing to leave because it’s not toxic… it’s even edible. It’s Diatomaceous Earth in the food grade variety – it can be eaten and they even provide a smoothie recipe! “Kills roaches, ants, earwigs, silverfish and other crawling insects”…. kills bedbugs, fleas, ticks…. for indoor and for outdoor use…. It’s used by applying a dusting of the fine powder in cracks and crevices, sockets, the corners…. I LOVE this product! It’s also used as a flea and tick preventative, used to store food and used for a variety of other purposes too incredible to just list but will amaze.